The South Pacific Regional Environment Programme (SPREP) has released "Collaborating for Sustainability: A Resource Kit for Facilitators of Participatory Natural Resource Management in the Pacific." This kit is one of a number of resources being produced with the support of international Waters Project (IWP) and other programmes within SPREP and other regional and international agencies that give more attention to these human factors in natural resource management. Some of the material and approaches are new and innovative. The document is based on the premise that addressing environmental problems more often than not involves multi-stakeholders at local, national or international levels making resource management challenging work indeed. It has been proven in many projects across the region that outcomes are more likely to be sustainable and people’s well-being and livelihoods improved if stakeholders participate in resource management initiatives during the very early stages of project planning and design and all key stakeholders play a role in decision-making. Bourke, R.M. and Vlassak, V. (2004). Estimates of Food Crop Production in Papua New Guinea. Land Management Group, The Australian National University, Canberra. This fascinating paper by the Australian National University's Land Management Group is now available on the web as a pdf. The summary is reproduced below. Estimates of the quantity of food produced in Papua New Guinea (PNG) are important for planning and research. Information contained in the Mapping Agricultural Systems of PNG database of the proportion of land devoted to various food crops allows new estimates to be made. To calculate annual production for each staple crop, estimates of the proportion of garden area devoted to each crop for each agricultural system were combined with census data on the rural population in 2000 (4.3 million rural villagers), mean garden area planted per person per year and mean crop yield for that environment. These data allow estimates to be made for banana, cassava, coconut, potato, Queensland arrowroot, rice, sago, sweet potato, and various taro and yam species. Total annual staple crop production is estimated as 4.5 million tonnes (1050 kg/person/year), with an energy value of 4.3 × 1012 kilocalories (2770 kcal/person/day). It would require an additional 1.2 million tonnes per year of imported rice to replace the energy value of these staple foods, with a retail value of K2850 million. Sweet potato accounts for almost two-thirds (64%) of production of staple food crops by weight and 63% by food energy. No other staple in PNG contributes more than 10% by weight or food energy. The contribution by weight for the more important foods is: banana (9.7%), cassava (6.0%), yam (6.0%), Chinese taro (Xanthosoma) (5.0%), Colocasia taro (5.0%), coconut (2.2%) and sago (1.8%). The proportions of food energy produced by these crops are similar to their values for weight. Sago, coconut and rice are exceptions; their proportions of food energy are greater than their contribution by weight. The significance of the various staples varies between provinces in the lowlands, but sweet potato dominates production in the highlands. An independent check of the production figures is made by calculating the energy in the food grown in representative agricultural systems and for all provinces. The energy needs from staple foods of the human population are compared with the available energy. Estimates of production and human needs are very similar for lowland agricultural systems and for provinces where most systems are in the lowlands. For highland provinces, production is 47% greater on average than the estimated human requirements. This is expected and consistent with the large domestic pig populations which are fed significant amounts of sweet potato. These figures suggest that about one third of all sweet potato tubers are fed to pigs in the central highland valleys, or about one quarter of all sweet potato production in PNG. Average sweet potato production per person for all PNG is 670 kg/year, with about 500 kg of this produced for people and the remainder for pig consumption. The figures generated here are compared with estimates made as part of the Survey of Indigenous Agriculture conducted in 1961–1962, with data generated from the 1996 PNG Household Survey, and with figures published annually by the Food and Agriculture Organization of the United Nations. The most important difference between the surveys is that the new estimate for sweet potato production is more than twice that made in the first two surveys. A major change over the past 40 years has been the increased significance of crops of New World origin, that is, cassava, potato, sweet potato and Chinese taro. In contrast, production of staple crops of Asia-Pacific origin (banana, sago, taro and yam) has either decreased or is similar in magnitude to that of 40 years ago. From the University of the South Pacific (USP). Dr. Randy Thaman, Professor of Pacific Islands Biogeography at USP, gave the keynote address on the opening day of the Tenth Meeting of the Subsidiary Body on Scientific, Technical and Technological Advice (SBSTTA) of the Convention on Biological Diversity (CBD) held in Bangkok, Thailand, 7-11 February 2005. In his address, entitled “Sinking Island Arks - Island Biodiversity and Island Living Under Threat”, Professor Thaman provided a platform for the discussion, finalisation and acceptance of a new thematic ten-year work programme on “island biodiversity”under the Convention of Biological Diversity (CBD) for consideration at the eighth meeting of the Conference of the Parties to the CBD to be held in Brazil in 2006. 188 countries are party to the CBD, which has as its central goals, the conservation, sustainable use and equitable sharing of the benefits to the Earths fragile biodiversity inheritance (ecosystems, species and genetic diversity). In his address, Professor Thaman stressed the uniqueness and fragility of island biodiversity (IBD) and obligate dependence that island nations and peoples have on island and associated marine biodiversity as a foundation for sustainable development. Professor Thaman said that from a strictly biodiversity conservation perspective, most of the generalizations with respect to the uniqueness and fragility of IBD are relevant for both small island developing states (SIDS), but also for larger, more developed island states and island communities. From a human or cultural perspective, the promotion of sustainable use and benefit sharing aspects of IBD have particular relevance to those small island nations and islanders who wish to, or must live on, smaller islands away from capital cities, main islands, and the mainstream of development and homogenizing forces of globalization . . . those islanders who depend most on their IBD! Professor Thaman also stressed that the new ten-year Island Biodiversity Programme of Work under the CBD provides a unique opportunity for building bridges among ALL ISLANDS AND ALL ISLAND NATIONS in efforts to conserve, sustainably use and equitably share IBD as a foundation for sustainable development. Professor Thaman suggested that, in addition to being among the Earth’s biodiversity “hot spots”, islands also include some of the Earth’s most biodiversity- poor and highly threatened biodiversity “COOL SPOTS”! He stressed that some of these “island arks” are sinking! Some have had most of their biodiversity destroyed, degraded and exported, as in the case of Nauru, in order to enrich others’ soils! Others, like Tuvalu, Kiribati, the Marshall Islands and, most recently, the islands of the northern Indian Ocean, such as the Maldives and the Nicobar Islands (where over 700 indigenous coastal people died) are being swamped and ravaged by the seas around them and taking on water. Many were being invaded and swamped by alien pests, hitchhikers and stowaways (weeds, birds, snakes, land snails, ants, diseases, etc.) that are killing, or forcing overboard, many of the original, often endemic, indigenous passengers (plants and animals), which is akin to biodiversity genocide. Furthermore, an increasing number of “captains” and “human crews” of ancient island arks, Thaman suggested, seemed to be losing their way. Many had lost ancient navigation skills and knowledge of the bounty and fragility of their seas and island ecosystems. No longer able to maintain their arks, they no longer know, understand or care for their passengers, allowing them to be invaded, perish, thrown overboard or exported to more urbanized arks or continents . . . ., often with little knowledge and/or regard for the long-term sustainability and equitable sharing of limited supplies (resources) or maintaining intricate social (ecological) relationships. Our mission, in the context of the CBD, Thaman went on to suggest, is to ensure a sustainable future for “island life”. In order to do so, we must ensure that all stakeholders know what island biodiversity is, how unique, fragile and vulnerable it is compared to continental biodiversity, and why island communities and nations are so disproportionately dependent on it for their ecological, economic and cultural survival. The need to understand island “biodiversity” and its predominant role as the foundation for all island living. That there is a serious global crisis related to the loss of the Earth’s and island biodiversity. That island and associated marine biodiversity are disproportionately vulnerable to this crisis. That it affects all of us. Professor Thaman emphasized that islands offer some of the best answers to, and opportunities for, solving the global biodiversity crisis and that the conservation of island biodiversity would play a major role in helping to stabilize the Earth ecosystem, promote sustainable development and PREVENT and alleviate real poverty! He stressed in particular that small isolated offshore island in all countries offer some of the greatest opportunities for protecting plants and animals and associated human cultures that are currently under threat or disappearing on main islands and continents. This is because they often are free from invasive pests, diseases, parasites and predators, including more urbanized human communities, and often harbour some of the only remaining populations of unique and threatened organisms and relatively sef-sufficient human communities. increasing capacities and financing the implementation of the programme of work. Each of these goals has associated global targets and times frames and island-specific actions for the parties to the CBD. Professor Thaman believes that both the Convention on Biological Diversity (CBD), to which some 16 Pacific Island countries, including all of the USP member countries, except Tokealu, are party, and the new 10-year work programme on Island Biodiversity, offer island countries, whether developing or developed countries, one of the greatest opportunities to promote a truly sustainable future for island peoples and for keeping our many island arks and their precious biological crews afloat and on course for millennia to come. Among the some 1000 official delegates of government and non-government at the SBSTTA Meeting were many USP graduates, including including Touea Titaake, Enate Evi, Manasa Sovaki, Russel Nari and Joe Horokou, who were the official government representatives and spokespersons of Kiribati, Tuvalu, Fiji, Vanuatu and Solomon Islands. Ana Tiraa-Passfield, another USP graduate, who represented the Cook Islands si also a member of the Ad Hoc Technical Expert Group (AHTEG) responsible for preparing the draft workplan on Island biodiversity. Also serving on the Island Biodiversity AHTEG is current I-Kiribati Marine Studies Programme and Geography Postgraduate student, Nenenteiti Ruatu. She is currently on study leave from her job as the Kiribati National Biodiversity Strategy and Action Plan coordinator. HONIARA, Solomon Islands (Solomon Islands Broadcasting Corp. Feb. 16) – The Solomon Islands Foreign Investment Board has issued a business license to the New Britain Oil Palm Company, paving the way for work to start the project. Agriculture and Livestock Minister, Alfred Sasko, said both government and the company have cleared the last hurdle in the process to starting project operations. Mr Sasako says the certificate of registration means that the company will now be able to establish an office in Honiara, and that work should start within a matter of weeks. He says the groundbreaking ceremony is being planned within weeks as company lawyers have only been waiting for the issuance of the certificate to make necessary arrangements. Mr Sasako says the company had started advertising for interested workers since October last year. He said he understands the company will need about 7,000 workers to start work on the oil palm plantation. The potato industry in Papua New Guinea may be given fresh direction after a two-day Potato Forum, which began yesterday and ends today. The forum in Mt Hagen has had representations from major players in the industry and has created a platform for stakeholders to generate ideas and recommendations for the future of the industry since it was hit by the late potato blight in February 2003. The forum is the first major one since the blight struck. where funding would come from to implement recommendations and policies that come out of the forum. Mr Ross also highlighted the fears of a more destructive potato disease known as “potato cyst nematode” which he said was more risky for the industry and that he would also highlight the risks at the forum. Stakeholders participating include representatives from the mining sector including Porgera Joint Venture, Ok Tedi and Lihir, Rural Industries Council, Department of Agriculture and Livestock, key private sector representatives, financial and tertiary institutions, and government representatives. A broad range of topics have been covered including industry overview, overview of the late blight disease and its implications, strategies for future security, link between government and industry, seed supply and final recommendations for policy direction through the National Government. Most of yesterday was taken up by registration and introductory views and was followed by field visits in the afternoon. The forum was introduced by Rural Industry Council chairman John Nilkare. Speakers spoke on historical aspects of the industry, production trends, the late blight effect, current status of industry and the importance of industry to PNG. Today, papers will be presented on the scientific overview of the late potato blight, the role of institutions, how industry handled the situation, chemical trial, quarantine issues, strategies for future security, future direction, evaluation on variety performance, chemicals and safety aspects, retailers association, and recommendations for the future. RECOFTC is an international organization that works closely with partners to design and facilitate learning processes and systems to support community forestry. It seeks to promote constructive multi-stakeholder dialogues and interactions to ensure equitable and sustainable management of forest resources. You can find its e-newsletter here. Vision: Local communities in the Asia-Pacific region are actively involved in the equitable and ecologically sustainable management of forest landscapes. Mission: To enhance capacities at all levels to assist people of the Asia-Pacific region to develop community forestry and manage forest resources for optimum social, economic and environmental benefits. Goals: More effective policies, institutions and processes for community forestry operate in the Asia-Pacific region. Purpose: Individual, institutional, country and regional capacities to enhance community forestry policies, institutions and processes are strengthened. The list of RECOFTC's open subscription international courses and study tours from January to September 2005 is now available for viewing. The fifteenth course on seed saving and preparation for working on seed saving projects is coming up in April at the Seed Centre in April Seed Centre, Byron Bay, NSW. Dates for this popular and practical course are 2nd to 7th April 2005, with the sixteenth early October. The first four days of the course are on seed saving and the last two are about preparation for and working on permaculture and seed saving projects. Teachers: Jude and Michel Fanton have worked in Permaculture for 24 years, teaching 18 Design Courses in Australia and overseas. In the last eight years they have initiated seed networks in the Solomon Islands, Cuba and Cambodia and consulted on strategies for preserving traditional varieties in Japan, Cambodia, India, Nepal, Tonga, East Timor, Afghanistan and for 10 countries in Africa. They have trained a number of young people who have gone to work in the Solomon Islands, India, Japan, Cambodia, Indonesia, East Timor, Brazil and Ecuador. They offer what they have learnt from these experiences and nineteen years of running The Seed Savers' Network in Australia to people who have an interest in working overseas or in community projects on seeds and Permaculture. There are also guest lecturers such as aid workers and international activists. Venue: Two kilometres south of the Byron Bay Post Office, one acre undulating gardens near the sea which have been designed on Permaculture principles with seed bank, annual garden, food forest, terraces, seed gardens, orchard, chooks and ponds. Accommodation: There are many options in Byron Bay including a camping ground not far from the Seed Centre. We can send a list of options. Teaching style: Participatory and practical with many exercises in the garden and with seeds. All past groups have experienced a strong sense of camaraderie and group learning. Most meals are shared and some cooked together. After 4pm there is an optional practical of one and a half hours in the garden. There will be a research assignment and a presentation required of each participant, either individually or in groups. Participants: This is a course for people who are willing to work as volunteers or on a local wage on community based sustainable agriculture projects, particularly those inspired by Permaculture and seed saving. The course aims to help people who have knowledge of horticulture, household food production, environmental management, health, nutrition, etc., to prepare themselves for development work. A leading ethnobotanist will tomorrow (19 February) receive the 2004 International Scientific Cooperation Award from the American Association for the Advancement of Science (AAAS). Michael J. Balick's research has helped transform ethnobotany — the study of indigenous people's use of plants — into an internationally recognised academic discipline. Balick is currently involved in ethnobotanical research in Micronesia. The award citation recognises his efforts to promote scientific collaboration within the field. In particular, it stresses his research emphasis "on preserving traditional knowledge and respect for the values of local peoples, and his support for the development of scientific institutions in areas of the world where they are needed most". Balick has worked throughout Central and South America, Asia and the Pacific. In Belize, for example, he established links between ethnobotany and economic development, and co-founded the Ix Chel Tropical Research Foundation, a centre devoted to traditional medicine and cultural preservation. In Costa Rica, Balick helped to create a major botanical garden while in the Caribbean, he promoted research in ethnobotany and economic botany. "Balick was a leader in opening the dialogue and debate on intellectual property rights long before it was fashion," said Sherburne Abbott, chief international officer of the AAAS. "He also worked to ensure that local people would benefit from any discoveries that were made from their plants." He also serves as adjunct professor in four universities in New York, United States, and has published more than 14 books. Since 1980 he has been working in New York Botanical Garden, and studying traditional healing practices used by the city's ethnic communities. From Christoph Muziol of the SPC/GTZ-Pacific German Regional Forestry Project. Of course, the protective effects of mangroves against tsunamis mainly depend on the scale of the tsunami and the width of the forest and, to a lesser extent, the height, density and species composition. As nations around the Indian Ocean discuss plans for a tsunami early-warning system, environmental scientists here point to an existent, natural form of disaster minimization: mangrove forests. Dense mangrove forests growing along the coasts of tropical and sub-tropical countries can help reduce the devastating impact of tsunamis and coastal storms by absorbing some of the waves' energy, say scientists. It was a dense belt of mangrove that saved the village of Pichavaram, around 40 km from here, from extensive damage by the gushing tidal waves. Indonesia will replant huge swathes of mangrove forest along its vulnerable coastline to help provide a buffer against possible future tsunamis, the forestry minister said on Friday. The Indian Ocean tsunami highlighted the life-saving benefits of mangroves and reefs, officials and environmentalists say, leading some Asia nations to look at replanting lost or damaged mangrove forests. So, with the Regional Forestry Programme’s efforts to support the sustainable management and conservation of mangroves in the Pacific, I think we are on the right track. The news item in the Saipan Tribune reproduced below prompted the following comment from Konrad Englberger, SPC Plant Protection Officer in Micronesia: This is bad news that the betel nut disease is back in CNMI. Some reports indicated that the disease was eradicated from CNMI, apparently this was wrong. I suppose the same will apply for Guam. FSM and Palau should be alerted of this destructive disease. FSM has a 2 million dollar betel nut export industry. We need to discuss if we should introduce a Clorox dip on shoes for people who visited farms/country in CNMI and Guam. The fungus Phytophthora meadii, which causes the Betel Nut Bud Rot Disease, has resurfaced and has already killed over 150 betel nut trees on Saipan. According to agricultural consultant Isidoro T. Cabrera of the Northern Marianas College Cooperate Research, Extension and Education Service, the disease has already affected trees in an area in Papago and two areas in Capitol Hill. Cabrera discovered the spread Friday during a survey around the island. The disease also destroyed thousands of trees on Guam from late 2003 to 2004, raising concerns from growers who depend on the sales generated from the betel nut. Cabrera said the disease spreads during rainy season, especially if a typhoon is experienced. "That's the optimum time for the disease to start spreading," he said. "It takes high humidity, wind, and heavy rain for this disease to actually rejuvenate." He said the disease was dormant for years because the island was not hit by a typhoon, but may have resurfaced because of the wet weather experienced last year, with Typhoon Tingting and Supertyphoon Chaba striking the island. The fungus produces microscopic spores that are easily blown around and dispersed in the wind and rain. It is carried to other neighboring trees and infects them. Once the spores are blown and has the right humidity and temperature, that's how the other trees are infected. It continues to spread to neighboring areas. After a month-long incubation stage on the newly infected tree, symptoms of the disease will then appear and the tree will die in about another month. Symptoms of the fungal infection include lesions on the leaves, dead young leaves or deterioration of the green part of the plant at the base of the leaves. Cabrera said once infected, a tree has no chance of survival. He suggested that the next best thing to do is to cut the tree and burn to prevent the disease from spreading. 23 February 2005, Rome - The Philippines will send 28 experts and technicians to six Pacific Island countries, the UN Food and Agriculture Organization (FAO) said yesterday at the signing ceremony of a new South-South Cooperation agreement.23 February 2005, Rome - The Philippines will send 28 experts and technicians to six Pacific Island countries, the UN Food and Agriculture Organization (FAO) said yesterday at the signing ceremony of a new South-South Cooperation agreement. FAO's South-South Cooperation Programme is a global initiative that aims to strengthen cooperation among developing countries at different stages of development to improve agricultural productivity and ensure access to food for all. The initiative is part of a broader programme, the Regional Programme for Food Security in the Pacific to which the Government of Italy has committed US$4.5 million. "The Pacific Islands' constraints are in particular their smallness, remoteness, geographic dispersion and vulnerability to natural hazards. They also depend heavily on external economic factors such as changes in the global trading environment," said Henri Carsalade, FAO Assistant Director-General, Technical Cooperation Department, during a signing ceremony at FAO headquarters in Rome. "The project will help participating Pacific Island countries to adjust to changes in the international trade environment and to improve household food security through income generating activities," he said. The Philippines will provide technical support for community-based microprojects to six island nations in the Pacific Islands Forum, namely: Kiribati, Marshall Islands, Palau, Papua New Guinea, Solomon Islands and Tuvalu. "It is an honour for our country to provide technical expertise to the Pacific," said H.E. Phillipe Lhuillier, Ambassador of the Republic of the Philippines. "The Philippines will also benefit from the exchange of technical information and we thank the Government of Italy for its financial support to the Regional Programme for Food Security," he said. The Philippines will provide four experts in the fields of Water Control, Crop Production, Animal Diversification and Artisanal Fisheries/Aquaculture who will be based in Port Moresby, Papua New Guinea, for a period of two years. Four technicians, qualified in various areas of expertise will be fielded to each of the six island nations, resulting in a total of 24 technicians for the same period. Under a separate agreement, the People's Republic of China is providing assistance to the Cook Islands, Federated States of Micronesia, Fiji, Nauru, Niue, Tonga, Vanuatu and Samoa. The South-South Cooperation Programme is part of FAO's Special Programme for Food Security (SPFS) designed to improve lives in some of the world's poorest countries by rapidly increasing food production, improving people's access to food and reducing their vulnerability to climatic events such as drought and floods. Today, the SPFS is present in more than 100 countries, and the South-South Cooperation Programme is being implemented in 31 countries, with over 700 experts and technicians currently working in farming communities. Zimbabwe, once the breadbasket of southern Africa, has seen such a collapse in its agricultural base that over 5 million people will need charity to prevent starvation by the end of the year, according to the UN's World Food Programme. President Robert Mugabe's land reforms have seen a dramatic drop in commercial maize production, leaving 38% of the population undernourished. Poor harvests in 2002 and 2003 left millions of people needing food assistance. Last year Zimbabwe's farmers planted only about a third of their usual fields and the World Food Programme has designated Zimbabwe as a "hunger emergency zone". Food will be a major issue during the presidential elections scheduled for next month. Yet small-scale farmers are not without hope. They are benefiting from "born again" sweet potato plants, developed by a team of Zimbabwean scientists. The eight agricultural graduates are employed by Agri-Biotech, founded by Edinburgh-born scientist Dr Ian Robertson, the company's chief executive, who teaches agriculture at the University of Zimbabwe. The plants make it possible for a 30-metre square plot to feed a family of seven all year. Over 30,000 people have benefited in the past two years. And that's just the beginning: so far the company has covered eight of Zimbabwe's 56 districts, chosen by the Zimbabwe Farmers Union. The Agri-Biotech team call the plants "born again" because they have found a way of removing the virus that plagues sweet potato crops. In a GM-free tissue culture process, they employ cutting edge science literally. They dissect out the 0.25mm tip of the bud, which is free from viruses and other micro-organisms, and throw the rest away. The lab team then grows the bud tip in a test tube for nine months into a virus-free plant, and keeps on sub-culturing it to increase numbers. From there they transplant the plants into plastic greenhouse tunnels and take cuttings from them. These are bought by donors, such as the Swedish Cooperative Centre (SCC). The Stockholm-based NGO is funding Agri-Biotech to supply 3,000 starter plants to 160 nursery farmers. "We need good lab work plus good greenhouse work to deliver to good farmers," says Robertson, a specialist in plant tissue culture. Unfortunately the virus cleansing is not permanent. "The clean plants will inevitably pick up new viruses and degenerate," says Robertson. "Farmers come back to us for new clean material every few years. "The starter plants grow in August, and are irrigated during the following months of sunshine. Many resettlement farmers have access to a well, stream or irrigation system. Each of the 160 farmers can then sell the runners to over 100 neighbours in time to plant for full growth during the rainy season, which starts in December. Meanwhile the nurserymen lift the virus-free sweet potato tubers and sell them early when prices are good, at a time when neighbours are growing for "stomach-fill" for their families. Nothing is wasted. Tubers that are too small or too big to sell at the market, or are damaged by insect pests, are fed to cattle. Boy Ncube was one of 20 nurserymen who were trained, over three days, in nursery management and field production by Agri-Biotech's liaison officer Reuben Tayengwa. Agri-Biotech then supplied Ncube with 3,000 cuttings of Brondal sweet potato as well as 200 stakes of Zambezi cassava. With the help of organic fertiliser, Ncube grew vines to sell. Over two years his 30-metre square plot expanded to three hectares. He has turned his initial delivery of $150 into sales of $16,000. This has allowed him to buy a cow and he is building a house, and will buy a "bakkie" (truck) to carry his tubers to market. His best field has yielded 50 tonnes per hectare, compared with the national average of six tonnes. Nicholas Chimbwedza started farming 2.5 hectares of Brondal two years ago. Selling vines, fertilised with cattle manure, earned him $150. He has started harvesting tubers from just 0.16 hectare and has earned $1,000. This has enabled him to buy a new pump for his field. He expects to earn over $15,000. Dickson Gumede has 0.32 hectare and expects a harvest of eight tonnes on a yield per hectare of 25 tonnes. In the current emergency SCC has contracted Agri-Biotech to deliver 1,000 plants each to another 1,000 "beneficiaries": disadvantaged orphans, old people who have lost their "middle generation" to HIV/Aids and single parents. In two years, thanks to Agri-Biotech's research and donor funding of some $300,000, the farmers have cashed in $1.2m. The company itself has made only $50,000 but it has employed eight graduates. The UK's Department for International Development is "very impressed with the excellent work and dedication of Ian Robertson and his team", says Tom Barrett in DFID's Zimbabwe office. DFID has developed a programme in collaboration with several NGOs and Agri-Biotech that will distribute the improved sweet potato planting material to as many as 2,000 of the poorest households in Harare. Care, with DFID funds, also has a programme that should reach 2,000 rural farmers in Masvingo province. Several European countries could find themselves in court if they refuse to lift their ban on kava. Fiji, Samoa, Tonga and Vanuatu have threatened to file a lawsuit with the World Trade Organisation, alleging an unfair ban on products linked to the kava root. Kava was banned in Germany and the UK, following reports it was linked to cases over liver failure. Many Pacific island nations have refuted this argument and have fought for years to reverse the decision. Two government ministries will have new Ministers when work resumes today. Salega's Member of Parliament, To'omata Alapati To'omata has been appointed Minister Agriculture and Fisheries. Former Agriculture and Fisheries Minister Tuisugaleataua Sofara Aveau becomes the new Minister of Natural Resources and Environment. He takes over former Natural Resources and Environment Minister Tagaloa Tuala Sale Kerselake, who recently became President of the Land and Titles Court. Tuisugaletaua's new portfolio includes the Samoa Meteorology Division at Mulinu'u, WESTEC and Forestry. While most of Samoa was busy preparing for Cyclone Olaf on Tuesday, To'omata was sworn in at the residence of the Head of State, His Highness Malietoa Tanumafili II, at Vailele. The ceremony was well attended by Cabinet members and To'omata's family and friends. In the absence of His Highness, Malietoa, Member of Council of Deputies Faumuina Anapapa conducted the swearing in ceremony. Prime Minister Tuilaepa Aiono Sailele Malielegaoi congratulated To'omata. He, however, warned him that he has a tough task ahead. The PM pointed out that whoever becomes a minister must work hard as a servant to the public and the department to which he had been appointed for. To'omata was the under-secretary to the Minister of Tourism, Commerce, Industry and Labour, Hans Joachim Keil. He has been a member of the Human Rights Protection Party (HRPP) since 1999. Before entering Parliament, he worked at Agriculture. To'omata holds a Bachelor of Science in Agriculture, and a Diploma in Tropical Agriculture. To'omata, 55, is married with seven children. He resides at Vailoa. APIA, Samoa (Samoa Observer, Feb. 8) – There is increased optimism in the coconut industry with the opening yesterday of a new production plant to be operated by Desico Samoa at Vaitele. Production is already underway at the government-funded 4.2 million tala (US$1.5 million) facility, was launched at a ceremony at the Vaitele plant. Minister of Finance Misa Telefoni said that the production plant, leased by Desico Samoa from the Provident Fund, is an investment for contributors and in the coconut industry. The Provident Fund is now the biggest shareholder in Desico Samoa, which was originally operated with Sri Lankan business interests but later ran into problems. "There will be critics who will say NPF is investing too much, and the projected return is inadequate," Misa said. But Government, Misa said, is fully supportive of the Provident Fund board's decision to both invest in Desico and in facilities for it. SPC's Plant Protection Service are funding and supporting MAFF&M Samoa in their efforts to mobilize communities to assist in the removal of breeding sites for the Rhino Beetle and looking after traps. This is being done through the use of traditional structures with the help of the Department of Internal Affairs, which handles all matters concerning villages. SPC entomologist Sada Lal is assisting through the testing of low cost pheromones and sending fungus and virus material for testing in NZ. A multi-phased public awareness effort began late last year with funding from the European Union. The main point is that "this is a Samoan government priority" and PPS is supporting MAFF&M efforts. Because the money & marketing end is looking good - opening of the new Desico Samoa coconut production plant - hence the need for controlling a pest that has popped up after many years of neglect. In the end: no nuts, no copra for the new Desico plant, no money in the hands of producers. The fire ant report from Tahiti is the Little Red Fire Ant (Wasmania auropunctata), less notorious than the more aggressive Red Imported Fire Ant (RIFA) (Solenopsis invicta) which is already in Brisbane, California and probably the recent report in the news from Hong Kong is also RIFA. The former is already in New Caledonia, Vanuatu, Solomon Is and also in Bougainville. While they are various methods, mostly use of formicides available, to control fire ants, the first action suitable for the region is prevention of entry into islands or countries through stringent surveillance or reporting systems at possible ports of entry as well as through legislations, trade agreements which minimize risks of importing fire ants and other potential invasive species. On the ground, PAPGREN members like Rosa can play a role by constantly looking out for these exotic ants and reporting to national quarantine or plant protection officers like Roy Masamdu of PNG NAQIA. Regionally, the Pacific Ant Prevention Plan (PAPP) has been developed as collaboration among several agencies to prevent the introduction of RIFA especially but is waiting funding to move it forward. “The PAPP lays out the recommended procedures, organisation and measures required to achieve the goal. It includes objectives under two broad headings of entry and establishment. In addition, a number of actions have been identified that are likely to be required in order to meet each objective. • operational measures which can be applied to each territory and will actually prevent ants gaining entry. • an active research programme to ensure the measures used to prevent establishment have a sound scientific base and thus will have the greatest likelihood of success. The Invasive Species Specialist Group (ISSG) of The World Conservation Union (IUCN) is coordinating this project, with support from members of the Pacific Invasive Ant Group” including SPC and SPREP. From Lois Englberger, news that Dave Walsh, instructor in Hotel and Restaurant Management at the College of Micronesia, is spreading the word about the opening of the Blue Plate Café on the Pohnpei campus next Tuesday 15 February. The Blue Plate Café is a teaching classroom for Hospitality and Tourism students, where they perform all aspects of the foodservice operation. Dave says: "I hope the Cafe will be of interest to the group ... [Island Food members and others] ... as we continue to incorporate many local foods into the menu. In addition, the Café serves as an excellent learning experience for our students so we are most grateful for any help with publicity." The recipes include the adaptations of international cuisine using local foods such as Breadfruit Vichyssoise and Karat Banana Ice Cream on Banana Bread. I bet karat ice cream on banana bread is really tasty. But, in light of everything else here about traditional foods and nutrition, I wonder whether the Blue Plate will also serve to demonstrate the value of traditional foods in traditional recipes? Now that the recent SIDS meeting in Mauritius has come to an end with the Mauritius Declaration, Wendy S. Elliott (elliott@ias.unu.edu), Junior Professional Fellow at the United Nations University Institute of Advanced Studies (UNU-IAS), has posted a follow-up to her recent article on SIDS and Access and Benefit Sharing (ABS) regimes for genetic reosurces. You can find it on the UNU-IAS website here. Discussions are underway between the Marshall Islands and Taiwan over the possibility of establishing a small-scale loan program to offer seed funding to local entrepreneurs. During a visit to Taiwan earlier this month, President Kessai Note held discussions with officials at the International Cooperation and Development Foundation in Taiwan on several issues, including the possibility of a small loan scheme. The Marshalls’ foreign minister, Gerald Zakios, says money from such a fund could be used for fisheries, agriculture and copra development. He says the programme would have funds that could be loaned to individuals unable to get loans from commercial banks because they lacked collateral, but in need of funding to expand a business operation. New Caledonia’s WWF (World Wildlife Fund) office has condemned the French Government for turning a blind eye to the country’s bushfires. WWF-New Caledonia coordinator Hubert Géraux says it would be ironic for France not to do anything because it will host a world biodiversity summit in Paris this week, “when in New Caledonia the house is on fire”. Mr Géraux says France had announced a “zero percent loss” target on biodiversity by the year 2010 but has forgotten that “a unique world natural heritage, in New Caledonia, is going up in flames”. Thousands of hectares of forest had gone up in flames between October and December 2004 after raging bushfires engulfed areas around New Caledonia’s Northern, Eastern and Southern parts of the Grande Terre and suburbs around the capital Nouméa. Early December 2004, ten of New Caledonia’s major environmental associations and NGOs claimed despite earlier warnings and calls for fire-fighters reinforcements, New Caledonia was burning. New Caledonia’s top ten associations and NGOs, including the local branch of the World Wildlife Fund (WWF) said New Caledonia’s natural heritage would be totally destroyed if nothing were done. The fires have also destroyed a sanctuary for forest-dwelling animal species, including the fruit bat (commonly known as the flying fox) and wild pigeons, the NGOs warned. The organisations also say most of the fires were of criminal origin, not only due to negligence, but also to arsonists. In November 2004, New Caledonia’s firemen asked French authorities to send reinforcements. They are suggesting that in order to release the necessary reinforcement, French authorities should first declare New Caledonia a disaster area, which would automatically trigger the procedure but the Nouméa fire brigade union says this is the worst situation they have faced for the past ten year. Biscuits. A local investor will soon venture into the production of cassava biscuit in Mansa district, Zambia with production equipment worth K269 million and an initial working capital of K50 million. Mr Abraham Chikonde said he had plans of producing 360,000 packets of biscuits annually worth K1.6 billion. In an interview, Mr Chikonde, who is proprietor of Lusaka's Procpres Enterprises Limited (PECO), said cassava flour consumption was estimated at 24 tonnes valued at K48 million every year. He said the sample production of his cassava biscuit had already received an overwhelming demand on the local market. Mr Chikonde was determined to ensure that his product penetrated the international market in future. He said with the Southern African regional initiative aimed at commercialising cassava production using modern methods, his project was assured of constant supply of quality cassava flour, a situation he said was key to continuity of production. Mr Chikonde lamented that though his company came up with a technology to produce cassava biscuits a few years ago, it could not venture into production because of poor quality of cassava flour. Glucose syrup. The International Institute of Tropical Agriculture (IITA) has announced the intention of the institute to embark upon research into the production of glucose syrup from cassava in line with the effort of the Nigerian government to improve the global market relevance of cassava. According to a report from the institute, the initiative will be a tripartite collaborative arrangement involving the International Institute of Tropical Agriculture (IITA), the University of Agriculture, Abeokuta (UNAAB), and the Scientific and Equipment Development Institute (SEDI), Enugu. The IITA report explained that the collaboration would mainly be centered on the production of some industrial products using cassava as the major raw material. "The objective is to research into small and medium scale cassava enterprises through the development of several industrial products. When fully developed, the project will create job opportunities and empower small and medium scale entrepreneurs economically to mop up possible excess cassava production in rural areas, and make Nigerian cassava production and processing more lucrative. Under the collaboration, the three organizations have successfully produced glucose syrup from locally fabricated bioreactor. The quality of the final product is close to what obtains in many advanced countries where the product is usually imported into Nigeria. Glucose syrup and dextrose are widely used as sweetening agents in confectioneries. High maltose and high conversion syrups improve moisture retention and color control in final product. Dextrose syrup in particular improves crust and dough properties, while high fructose syrups are used in frosting and fillings. The all glass double jacketed bioreactor (5 litre capacity) was fabricated at SEDI Enugu and it has a temperature probe, impeller shaft with impeller blade at an angle of 45 degrees and a control panel. Indicator lamps were also installed to monitor the status of the heating element and motor. The compression springs were used to assemble the equipment to allow for lateral and longitudinal expansion due to heating. Charge/feed hole was provided for charging the reactor without removing the upper plate while a wooden crate was also built into it for safe handling. Dr. Lateef Sanni, IITA Postharvest Specialist worked closely with Dr Akpan-Iyang Akpan, a Senior Lecturer at UNAAB and Mr O. O. Obiina, of SEDI to ensure the success of the project. Sanni remarked that the performance test of the reactor has been conducted at IITA Onne last December with cassava starch (10%w/v), distilled water, and enzymes as main ingredients. The extracted syrup was centrifuged and sugar level monitored using digital refractometer. The syrup was finally bleached to white colour. The yield is almost equal to production yield obtained elsewhere such as Thailand. Based on the success of the project, IITA is planning to organize an enterprise training activity for interested investors on production of glucose syrup from cassava starch. Participants will be trained on the production of glucose syrup, equipment fabrication and maintenance, cost benefit of the glucose syrup business and other Small and Medium Scale Enterprises (SMEs) information that will drive the market for continued production. Furthermore, it was disclosed that upon request, SEDI has capability of scaling up the reactor to cater for SMEs. IITA will organise the training in collaboration with other glucose syrup consultants including National Root Crops Research Institute (NRCRI), Umudike for future sustainability of the product. Sweeteners and syrups, used to prepare soft drinks and confectionaries, are a rapidly growing market in West and Central-Africa. At the moment, all sweeteners are imported (920 MT per annum in Ghana). A prerequisite of production is a supply of cheap, high quality starch, which is available in Nigeria-Matna, Real Foods, NSM etc. Currently, there is no commercial factory in Nigeria producing glucose syrup from cassava, despite the availability of abundant raw materials in Nigeria. Thanks for the interesting article on cassava. This article has been circulated to various NARI staff. PNG Gov't has signed a deal with the Bohai Company of Korea to go into ethanol production in PNG. The Cassava Ethanol Production Project has been approved by the Gov't. The project will be undertaken in two phases; Phase I will involve large scale production of cassava in PNG. The crops will be planted in large scale in PNG, harvested and shipped to Korea for ethanol production. The 2nd Phase will involve the actual setting up of the ethanol production factory in PNG. The site where the ethanol factory will be built is yet to be decided. NARI Laloki is working closing with the Committee set up for this purpose and have given our technical input in the highest yielding cassava vars we have in our national germplasm collection at Laloki. We have already supplied information on the high yielding varieties with their passport and characterization data. Hi Nice Blog. We Offer a wide range of back office and I.T Enabled data conversion services india Which match the high global standards in terms of efficiency and accuracy. Dr. Andrew Newman of the Ocean Medicine Foundation was here last year in Pohnpei, taking part in the two regional health meetings: the 9th Pacific Basin Medical Association conference and the 26th American Pacific Nurse Leaders Council Conference. He was interested in the work on Micronesian island foods, and the approach for promoting these foods, and asked to put them on their website. They have now got their new website going and the papers can be found here. The papers discuss aspects of pandanus, banana, giant swamp taro, and breadfruit. An interesting study on cassava from the Amazon which could have relevance to other root crops, including in the Pacific. Few studies quantify evolutionary processes in populations of domesticated plants in traditional farming systems. In February's Ecology Letters, Pujol, David and McKey show that these systems offer unusual opportunities for studying microevolution. 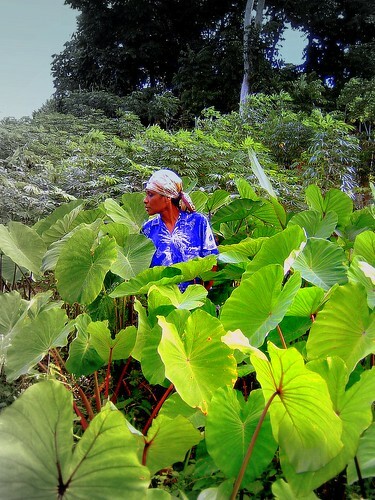 Cassava (Manihot esculenta) is clonally propagated, but Amerindian cassava farmers also regularly incorporate volunteer plants from sexually produced seeds into their clonal stocks (cuttings) at harvest time. These new genotypes renew diversity lost under clonal propagation. However, whereas multiplied clones are highly heterozygous, many of the volunteer plants are inbred. How does high heterozygosity persist despite their incorporation? The authors demonstrate a novel case of selection for heterozygosity that explains this paradox, showing that humans inadvertently favour heterozygous volunteers. When farmers weeded fields, they killed small volunteers, but retained large ones, which were also the most heterozygous. Demonstrating heterosis in nature usually requires large samples, but novel features of this system allowed escape of this constraint. ...if the Pacific wants to expand market. By Arthur McCutchan, Islands Business, January 2005. The drop in the quality of kava alarms Vincent Lebot. To the extent that this root crop geneticist at the French Agricultural Research Centre for International Development (CIRAD) in Port Vila, Vanuatu, is just about ready to give up drinking it. Lebot has been a kava consumer for the last 24 years. He’s an even keener researcher, having, since 1980, devoted most of his spare time trying to unravel the genetic mysteries of this unique Pacific plant. In the absence of any comprehensive study of the plant, it’s a challenge in which kava holds the advantage. “Very little research has been conducted because very few scientists work on kava,” Lebot said. “The reason for that is that there are not enough funds. Aid donors are ready to invest funds into crops which have already been researched elsewhere—like sugarcane, cocoa, coffee, coconuts and so on—because these are familiar to them. “They don’t like kava. It’s an obscure plant that is illegal in Europe.”The other reason, from a scientist’s point of view, is its complicated makeup. “This plant is a real nightmare for geneticists,” Lebot told delegates at the International Kava Conference in Suva last month. The symposium was the first organised by the International Kava Council. While he advocates greater private sector involvement in funding all aspects of kava research, he also places total blame for the deterioration of the industry in the sector’s collective lap. “It is a traditional beverage and a local crop, but the private sector here should take full responsibility for the decline in the quality of kava produced in the Pacific,” Lebot says. “In the absence of a regulatory body or regulatory policies, the private sector is free to do whatever it wants with kava. “It is free to improve quality, to add value to local products, to process it locally, to control the cultural practices of the farmers, and so on. The plant he calls “false kava” is known scientifically as Piper aduncum. It looks not unlike the Piper methysticum of pharmaceutical fame, but that is where the similarities end. He contrasts that with whisky traders in Scotland, wine traders in France and tea traders in India. “Not only are they traders, they are connoisseurs of their product. In the Pacific the private sector is not proud of the product it is dealing with. Kava farmers who do not know any better also contribute to the state of the industry, “selling the wrong varieties to buyers, or root stocks with toxic unpeeled basal stems,” Lebot said. The region’s failure to realise the potential of this plant will effectively kill off any commercial benefits it can obtain from it. countries in not only larger quantities but at a cheaper price and of better quality,” Lebot said. Poi millers used 1.3 million pounds of taro in the fourth quarter of 2004, down 4 percent from the previous quarter but up 10 percent from the fourth quarter of 2003, the Hawaii Agricultural Statistics Service estimates. Production came in at 420,000 pounds in October, down 5 percent from the month before, the same amount in November, and 450,000 pounds in December, the second highest monthly production of the year, after July. For the full year 2004, total taro for poi production was 5 million pounds, up 6 percent from 2003. "Taro farmers faced weather conditions that were less than ideal for taro farming during the fourth quarter," said HASS Director Mark Hudson. "Excessive rains and cloudy skies slowed development." October marks the start of Hawaii's wet season and lived up to the name, with especially punishing rain in that first month. Massey scientists are leading the way in a landmark international research project that aims to identify every living creature in the world using genetic ‘barcodes’. Borrowing a concept from scannable barcodes on supermarket products, this project will develop an electronic inventory to identify every organism in the world, but will use a molecular barcode instead of a black and white stripe. At the forefront of the project is a group of New Zealand scientists led by Professor David Lambert from the Allan Wilson Centre for Molecular Ecology and Evolution. With a cost of US$2.5 million and a time-frame of 20 years, DNA barcoding rivals the Human Genome Project. The practical benefits will be wide reaching, says Professor Lambert. Data will be stored for fast and easy retrieval and is expected to have valuable application in health, national border control, conservation management, food safety and environmental monitoring. These codes could also have a vital role in foiling bioterrorism. Professor Lambert’s team at the Allan Wilson Centre for Molecular Ecology and Evolution will create DNA barcodes for New Zealand’s flora and fauna, beginning with native birds and later including other animals, plants, insects and fungi.The team will also use DNA from ancient bones and soft tissues to identify extinct birds, such as moa, and their genetic similarity to modern species. “DNA barcoding to go backwards in time” is an important tool to measure past levels of biodiversity, Professor Lambert says.“We can only interpret the effects that humans are having on the plants and animals of the Earth by knowing precisely what was here in the past,” he says. DNA barcoding makes use of the cytochrome oxidase gene (CO1), which codes for an enzyme involved in the cell’s energy conversion system.The CO1 gene is present in all animals and, in most cases, has a species-specific DNA sequence that varies between, but not within, different species.Initial research by Canadian biologists showed that a portion of this gene can be ‘scanned’ to identify species, similar to using a barcode to classify supermarket products. Allan Wilson Centre researchers will sample these genetic barcodes from every New Zealand bird species and use them to assist the conservation of endangered species, including the kiwi, the North Island Saddleback, and black robins. Their results will be combined with other research groups from around the world to create a standardised electronic database. “Biodiversity, conservation, and biosecurity management can only be conducted against a background of the known species composition of ecosystems, habitats, or countries,” Professor Lambert says.The international DNA barcoding project is expected to be completed in 2025. From SPC's Pacific Pest Info Newsletter. An information and diagnostic package for taro pests in the Pacific is under development after the successful completion of a workshop for SPC staff at SPC Nabua. The workshop was the start-up for a new ACIAR-funded project called “TaroPest: An information and diagnostics package for taro pests of the South Pacific”. It is designed to be an information package that can be used by biosecurity officers, researchers and extension staff to allow them to easily access information they need that is designed appropriately. A preliminary version of the package is planned for completion in six months and SPC is looking forward to road testing the diagnostic system to PICTs. The team will particularly be looking for feedback on how easy it is to use the information system, appropriate design of the components and whether it serves the needs of users. Collaborating partners in the development of this information system include PNG’s National Agriculture Quarantine and Inspection Authority (NAQIA) and the Queensland University of Technology. As the technician on this project, SPC has recruited Mr Sarlesh Kumar, who has been with Koronivia Research Station plant protection section since 2000 and has work experience in both pathology and entomology. For more information contact the SPC project leader Dr Jacqui Wright (jacquiw@spc.int). We are pleased to announce the launch of the first beta-version of TaroPest, an identification and information kit for pests (diseases, insects, nematodes, etc) of taro in the South Pacific. TaroPest is the product of an ACIAR funded project involving the SPC Plant Protection Service, [PNG] National Agricultural Quarantine and Inspection Agency, and the Queensland University of Technology. TaroPest is aiming to be a one-stop-shop for information concerning regional pests of taro, with the target audience being quarantine/biosecurity officers, plant protection workers and field extension officers. While currently web based, TaroPest will eventually be available on CD-Rom, with printable hard-copy options. The product is free to access and use. Please visit TaroPest at http://taropest.sci.qut.edu.au. SUVA, Fiji (Fiji Times, Feb. 2) - An estimated 5,000 to 8,000 children in the West could drop out of school during the year or face serious health risks if the drought continues, a report by Save the Children Fund Fiji revealed yesterday. The non-government organization is calling on the Ministry of Education to act immediately as any unnecessary delay could only mean more long-term suffering for these children. A two-day drought assessment report, conducted last month, found that the children who were worst affected were from Ba, Tavua and parts of Rakiraki. It found that the harsh and dry conditions, which began in September 2004, had seriously affected farmers in the cane farming and agriculture belt. As a result these farmers were experiencing difficulties in sending their children to school because there was no money for bus fares, lunch, school fees and for books. It found that children who were undernourished in these areas were irritable and had low concentration in c lass because of poor nutrition and irregular water supply. The assessment found that primary school children in most schools were encouraged to share lunches with those who couldn't afford it. The finalization of a draft programme of work for island biological diversity for consideration and adoption by the Conference of the Parties at its eighth meeting, in 2008. Island biodiversity is a new thematic area under the Convention and involves a variety of cross-cutting issues of particular importance to Small Island Developing States (SIDS). An evaluation of the strategies and state of progress made towards achieving the 2010 biodiversity target, to realize a significant reduction in the rate of biodiversity loss by the year 2010. The draft reports of the Millennium Ecosystem Assessment, including the draft synthesis report on the status of Biological Diversity. The meeting will be immediately followed by the third meeting of the Ad Hoc Open-Ended Working Group on Access and Benefit Sharing, also to be held at the UNCC Conference Centre. Documents for SBSTTA, including press accreditation forms can be found at http://www.biodiv.org/doc/meeting.aspx?mtg=SBSTTA-10. For more information, please contact David Ainsworth, Acting Information Officer at tel. : +1 514 287-7025 or by e-mail: david.ainsworth@biodiv.org. A quality push for producers of African medicinal plants could help bring more novel products onto Europe’s herbals market, reports Dominique Patton. Can the Pacific learn from this experience? New herbal products are in “desperate demand” by European supplement companies, according to UK natural products consultant Denzil Phillips, as industry seeks novelty and innovation to boost the rather slow sales growth in recent years. Africa offers a rich and diverse source of little known medicinal plants - it holds more than 25 per cent of the world’s biodiversity - and some of its products displayed at recent natural product exhibitions have generated "loads of enquiries", says Phillips. However tough requirements for quality by leading supplement makers and a wave of new European regulations make it increasingly difficult for herbal products to enter the market. A major research programme, aiming to develop a series of trading standards for the top 50 medicinal plants grown in Africa, could help to make this process a little easier, suggests Phillips. The standards will be based on quality control, rather than monographs, he told NutraIngredients.com, and are being worked on by a pan-African research group. Quality standards for the first 20 products under review will be discussed at a meeting in South Africa next month. “It is not easy launching any exotic product in Europe but these standards will be very useful for anyone looking to submit a dossier [to support a product under new herbal regulations]," he said. Some African plants have become popular in Europe in recent months, including the herbal known as umckaloabo (pelargonium reniforme), which is taken as a natural antibiotic and seeing strong interest in Germany under Schwabe's Sptizner business. Hoodia is another African plant getting significant attention after a licensing deal between UK-based drug developer Phytopharm and global food manufacturer Unilever. Phytopharm has shown the plant to have appetite-suppressing qualities, although supplies, collected from the wild until the Phytopharm investment, are currently restricted. Devil’s claw and pygeum extract, a rival to saw palmetto, are also increasingly sought in Europe. A new look at global biodiversity hotspot finds a number of new ones, including one in the Pacific, the East Melanesian Islands, which joins Southwest Australia, New Caledonia, New Zealand and Polynesia-Micronesia (includes Hawaii) on the Oceania list. The new book Hotspots Revisited identifies 34 regions worldwide where 75 percent of the planet’s most threatened mammals, birds, and amphibians survive within habitat covering just 2.3 percent of the Earth’s surface (roughly equivalent to the combined areas of the five largest U.S. states). This habitat originally covered 15.7 percent of the Earth’s surface, an area equivalent in size to Russia and Australia combined. The new analysis shows that an estimated 50 percent of all vascular plants and 42 percent of terrestrial vertebrates exist only in these 34 hotspots. The Madrean Pine-Oak Woodlands, a rugged, mountainous area stretching from Mexico to the Southwestern United States, is one of nine newly identified hotspots. Three other hotspots that extend into U.S. states or territories - the California Floristic Province, the Caribbean Islands, and Polynesia-Micronesia - remain under severe threat. Hotspots Revisited (CEMEX, 2004) contains the results of an in-depth reanalysis of global hotspots, a widely used prioritization strategy for allocating conservation dollars to areas where they can do the most good. “The biodiversity hotspots are the environmental emergency rooms of our planet. This latest assessment underscores the value of the hotspots concept for defining urgent conservation priorities,” said Russell A. Mittermeier, president of Conservation International (CI) and co-editor of the new book. "We must now act decisively to avoid losing these irreplaceable storehouses of Earth’s life forms." Nearly 400 specialists contributed to the four-year-long hotspots reappraisal. Their analysis has resulted in an increase in the number of hotspots from 25 to 34. The East Melanesian Islands Hotspot was added because it had degraded dramatically over the last five years; the Madrean Pine-Oak Woodlands, Japan, Horn of Africa, Irano-Anatolian, Mountains of Central Asia, and Maputaland-Pondoland-Albany (in southern Africa) were added because of newly available data showing they qualify for hotspot status; and the Himalaya and Eastern Afromontane regions have been identified as distinct hotspots in their own right. The scientists delved beyond species to identify genera and families that are unique to the hotspots, concluding that hotspots also hold a disproportionately high degree of unique evolutionary history. Madagascar and the Indian Ocean Islands Hotspot, for example, has 24 plant and vertebrate families that are found nowhere else on Earth. "We now know that by concentrating on the hotspots, we are not only protecting species, but deep lineages of evolutionary history," Mittermeier said. "These areas capture the uniqueness of life on Earth." The hotspots concept was pioneered in 1988 by British ecologist Norman Myers, who recognized that hotspot ecosystems (most often in tropical forest areas) cover a small total land area yet account for a very high percentage of global biodiversity. The concept was subsequently refined by Myers and CI, most recently in 2000. “This new analysis has benefited greatly from increased collaboration among countries and organizations, as well as from scientists’ ever-increasing knowledge of species and their habitats,” said Gustavo A.B. da Fonseca, executive vice president of CI. Two factors determine which areas qualify as hotspots: number of endemic species (those found nowhere else) and degree of threat. Plants are used as a measure of endemism, and each of the hotspots holds at least half a percent of the total diversity of vascular plants as endemics; this translates to 1,500 species of vascular plants found exclusively within its boundaries. Degree of threat is determined by the percentage of remaining habitat, with each hotspot having lost at least 70 percent of its original natural habitat. Some of the hotspots have less than 10 percent of their original natural habitat. 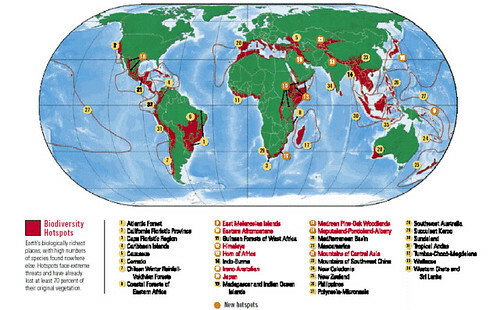 The threats to the hotspots include: habitat destruction; invasive species; direct human exploitation of species for food, medicine, and the pet trade; and climate change, which magnifies the effects of habitat destruction and fragmentation. The latest analysis offers mixed news about existing hotspots. On one hand, some hotspots have deteriorated significantly: a notable example is Southeast Asia’s Sundaland, whose forest loss has been driven largely by extensive commercial logging and agricultural projects. On the other hand, relatively little forest has been lost in the Atlantic Forest, and Madagascar looks set to hold steady following President Marc Ravalomanana’s recent pledge to triple the size of his nation’s protected area network. The Madrean Pine-Oak Woodlands hotspot is a 178,095-square-mile area encompassing Mexico’s main mountain chains, some isolated mountaintops in Baja California, and a few scattered patches in the southern United States (represented by the Madrean Sky Islands, a series of about 40 mountain-tops in southern Arizona and New Mexico, and other mountaintops in Texas, including part of Big Bend National Park). This hotspot is home to about 5,300 flowering plant species (of which almost 4,000 are endemics), about a third of the world’s oak and pine tree species, and over 1,500 vertebrate species (including 134 endemic species). Among many charismatic flagship species in the region is the volcano rabbit or zacatuche (Romerolagus diazi), one of the world’s smallest rabbits, which is found only in the mountains surrounding Mexico City. The hotspot is also home to up to 200 species of butterfly, of which 45 are endemic, and plays host to one of the world’s most famous wildlife spectacles, the over wintering mass of monarch butterflies (Danaus plexippus) in the pine forests of Michoacan. Threats to the hotspot include logging and intentional burning to clear land for livestock or agriculture. Hotspots Revisited was produced by CEMEX, one of the world’s largest cement manufacturers, in collaboration with Conservation International, Agrupación Sierra Madre, and the University of Virginia. It was edited by Russell Mittermeier, Gustavo A.B. da Fonseca, Michael Hoffmann, John Pilgrim, Thomas Brooks, Patricio Robles Gil, Cristina G. Mittermeier, and John Lamoreux. The book, which features nearly 300 photographs, also includes contributions from 197 of the specialists who participated in the hotspots reanalysis. The book can be purchased from www.conservation.org. Conservation International (CI) applies innovations in science, economics, policy and community participation to protect the Earth's richest regions of plant and animal diversity in the biodiversity hotspots, high-biodiversity wilderness areas and key marine ecosystems. With headquarters in Washington, D.C., CI works in more than 40 countries on four continents. For more information about CI, visit www.conservation.org. Nigeria is the world's largest producer of cassava, but not a significant player in the cassava export market. Thailand, a country that lags behind Nigeria in field production of cassava is the largest exporter of cassava products mainly in the form of chips and pellets for animal feed. Nigeria has so far been unable to develop competitive cassava - based industry because of high cost of tubers. However, with the agricultural programmes being pursued by the federal and state governments with support from development partners, yield per hectare will increase by as much as 300%, which will reduce cost of tubers by as much as one third, thereby making raw cassava tubers as competitive as in other cassava exporting countries. Cassava tubers, easy to grow, tolerant of neglect, thriving in some of the least friendly soil and climatic environments, take a minimum of twelve (12) months to germinate after planting. However, some newer varieties, though still on trial, geminates between 9 - 10 months. Average yield in the country is around 15 ton/ha; however current research efforts may increase this to about 40/50 ton/ha. Cassava has two seasons in Nigeria: wet season, which runs from March/April to October/November every year; and the dry season cassava, which runs from November/December to February/March of the following year. Cassava tubers are grown in commercial quantities in the rain forest zones of Anambra, Edo, Imo, Delta, Cross Rivers, Ebonyi, Enugu, Bayelsa, Akwa - Ibom, Osun, Oyo, Kogi etc. At the time of this report, price of a ton of tuber goes for between N5, 000 - N5, 500. Prices are usually favorable to the processor during the wet season but appreciate during dry season due to difficulty in harvesting. Cassava consists of 60 to 70% water. Processing it into a dry form reduces the moisture content and converts it into a more durable and stable product with less volume, which makes it more transportable. Processing is also necessary to eliminate or reduce the level of cyanide in cassava and to improve the palatability of the food products. High Quality Cassava Flour (HQCF) is an important confectionary and bakery ingredient that can be used to replace wheat flour 100% in many industrial applications. Potential industrial users are those in the bread making, biscuit production, cardboard and plywood industries to mention a few. Also, those in shrimp feed, ice cream and noodles production could use it as raw material ingredient. Local technologies abound and requisite skills are available for the production of Flour from both sweet and bitter varieties of cassava tubers. Decision to embark on this project is informed by the following principal reasons. Firstly, there is abundant supply of cassava in the country: Nigeria presently is the largest producer in the world, producing 33 million tons annually. Secondly, besides availability of cassava, there is a strong real and potential demand for products of cassava. For instance, the decision by flour millers following a Federal Government directive, to add 10% cassava flour to wheat flour in the preparation of baking flour has created new demand for cassava flour and strong rationale to embank on this project. Thirdly, government is set to support the cassava industry through provision of incentives and support measures that will enable government achieve its objectives and goals of job creation and poverty reduction. These incentives and supports will ultimately improve operating environment of the industry and contribute immensely to boost profitability of investment projects. Naturally, investment capital gravitates to areas with conducive operating environments, safety of investments and possibility of generating comparatively better returns on investment. Fourthly, the cassava industry is currently receiving much attention and support from Nigeria's development partners such as IFAD, UNDP, USAID, and IITA etc, thus making the industry attractive to private investors. These development partners are providing support through partnership with governments at the state and federal, and with multinationals, to build local capacity.